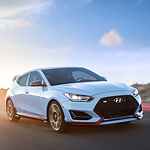 Three of the 2019 Veloster models are driven by a 1.6 L turbocharged engine block that pumps out 201 horsepower at 6,000 RPM. Using gasoline, this compact powertrain needs to revolve at only 1,500 RPM to spit out 195 pound-feet of torque. Additionally, the valvetrain of the turbo engine has the latest D-CCVT technology. Standard on this Hyundai hatchback, a rear diffuser solidifies the car's racing-inspired design. You'll also love the rear spoiler that's paired with the High Mount Stop Lamp. A tinted glass adds a sense of sophistication and mystique to the exterior profile. Select trims come standard with a wide sunroof that allows plenty of sunshine to illuminate the cabin.